​Alabama's football program can really do it all. It produces teams that can score and defend at an elite level. It also showed today that it can be very inspirational off the field as well. Some ​Crimson Tide fans decided to put up billboards in Baton Rouge that encouraged people to donate to the Red Cross for hurricane relief. The catch? They also trolled the LSU Tigers and their fans, taunting them by saying ​Tua Tagovailoa will drop a "Benjamin" on them. 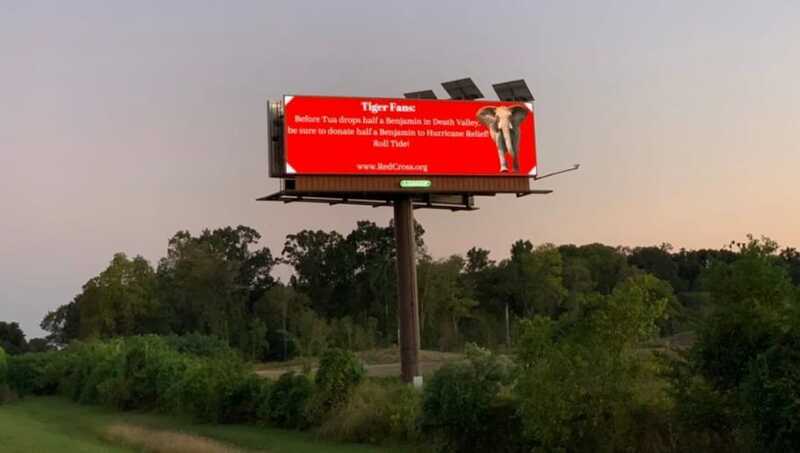 ​​Whether or not you're a Tide fan or a Tigers fan, you have to agree that the billboards encouraging people to donate to a good cause is a positive thing. However, Tua might have a tough time dropping 50 on LSU. The Tide will undoubtedly face their toughest test of the season against the Tigers this upcoming weekend. ​​LSU ranks 31st in the nation in yards per play allowed. Not exactly upper echelon, but a huge improvement from the rest of Alabama's opponents thus far. We'll see if the billboard prediction comes true soon enough.